It’s incredibly difficult to buy a home in today’s market – housing options are limited, prices are skyrocketing, and most families’ finances are struggling. For veterans, the problem is even worse. Returning home after years of service comes with all kinds of challenges, making it hard to build credit and buy a home. How can you afford a mortgage payment when your years of service are over? Luckily, there are options. VA home loans give military members the chance to own a home for less. VA home loans, also known as Veterans Affairs mortgages, are in demand. 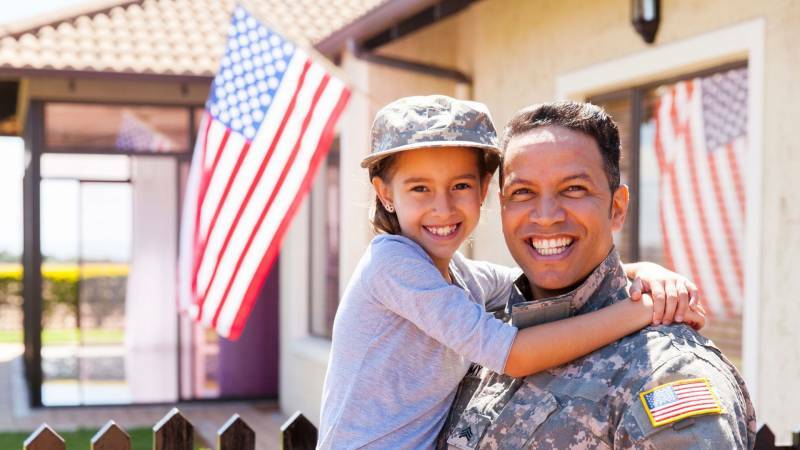 Veterans from all military backgrounds are turning to these special loans as the risk-free, affordable way to buy a home. A VA loan could give you the future home of your dreams – and you can get it for less. With high interest rates and limited financing available, most veterans don’t have the credit or financial flexibility required to secure an affordable traditional mortgage. A VA home loan levels the playing field, giving military individuals and families the support they need to afford a home. And the Department of Veterans Affairs includes benefits to reduce costs even further. These are the best reasons to choose a VA home loan over a regular mortgage. Don’t have thousands of dollars saved up for a home? Don’t worry – there’s no down payment required when you take on a VA loan. The typical homeowner is expected to pay a 10% down payment when taking on a mortgage. As Veterans United reports, 10% down on a $250,000 mortgage would total $12,500. Veterans can pay $0 to own the very same home. VA home loans offer more flexible financing. This means veterans can get a mortgage with a significantly lower credit score than the average home buyer. According to NerdWallet, the average home buyer had a credit score of at least 720. That’s a full 50 points higher than the average veteran home buyer in 2017. Most military members can secure a competitive loan with a credit score in the 600 range. Worried about your monthly mortgage payments with a loan? Your cost will be less than you’re expecting. VA loans make a house affordable for any budget. Veterans get a lower interest rate, typically 0.5% to 1% less than the national rate. That small percentage makes a big difference. Veterans United reports that the difference between paying 4% and 4.75% in interest is $40,000. Additionally, veterans don’t have to pay for mortgage insurance. This saves military members between $155 and $345 a month, per the Department of Veterans Affairs. That’s a huge discount — and one more home buying concern you don’t have to worry about as a veteran. Can You Afford a VA Home Loan? With these fantastic financial benefits, you can afford a mortgage with a VA home loan. And choosing this type of loan is entirely risk-free. Considered the safest home loan on the market for the last 10 years by NerdWallet, a VA home loan will only reduce the price of your dream home. And you won’t have to worry about tumultuous financial changes or increasing interest rates. A VA home loan makes buying a home not just a possibility but a reality. Why pass up the opportunity to own the property you’ve always wanted? It might be more affordable than you ever expected. To find out how you can buy a house with a VA home loan, perform an online search. You can qualify, compare options and offers, and get started today. Interested in a VA home loan? Start a search today.